It’s not secret that trying to be like Iron Man would not only lead to the end of all meaningful relationships for the rest of your life, and a perchant for nearly getting killed, but unsurprisingly it also means that you’d need to have a cool $10 billion in the bank to get the whole show on the road. A website aimed at saving Brits as much money as possible, has created an infographic showing just how much cash they would need to live the life of Tony Stark, the character played by Robert Downey Jr. in all three Iron Man movies. As the infographic shows, Stark may be the owner of a humongous technology and warfare company, be one of the brightest men on the planet and have women falling over themselves to get to him, but it’s the money that really makes the super hero tick. In fact, if it wasn’t for his huge wallet, he’d certainly not be the (imaginary) man he is today. The biggest cash sink has to be the plethora of suits owned by Stark, and that’s understandable considering they’re what makes Iron Man, Iron Man of course! 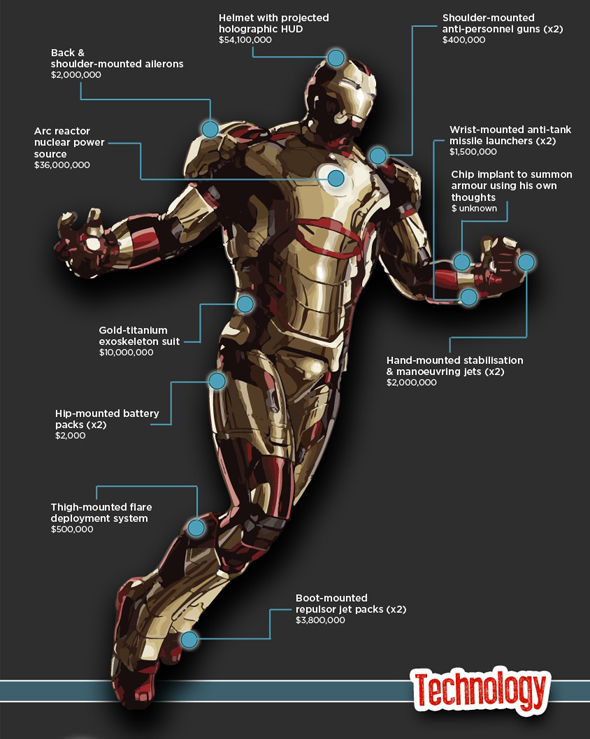 If you wanted to buy all of Stark’s metallic suits, MoneySupermarket.com estimates you’d need a cool $7 billion. Just for suits! But that’s not as deep as the infographic goes. Ever wondered how much some of the kit involved in making one of those suits would cost, individually? Well, the two hip mounted batteries are on the cheaper end of the scale at a mere $2,000. On the upper end? How about $54.1 million worth of special helmet and holographic HUD? We’re not sure what’s the more impressive – the fact that it would cost so much dough, or the fact that someone’s managed to sit down and work it out! What about that Arc reactor, the very heart of what makes Iron Man into Iron Man. In fact, it’s what keeps Tony Stark alive, which is possibly why it’s a snip at around $36 million to reproduce. Not that you could reproduce it of course, it’s all make believe you know! No matter how much the whole shebang costs, we’re really looking forward to seeing Iron Man 3 ASAP! Are you?